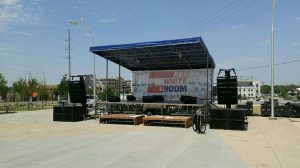 Stage and Roof System Rentals – Load Bearing, Mobile Stages and Shade Roofs! 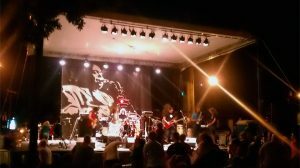 In Depth Events has been in the business of providing stage and roof system rentals for several years. Our clients are festivals, concerts and marketing firms as well as city governments doing July 4 and Christmas events. What’s our secret to our longevity in this industry? Safety above all else! 1) Load Bearing Rooftop – Also called a motor driven rooftop, or motor-driven canopy, this rental stage and roof system is typically used on larger events. This rooftop structure can hold a significant amount of weight, including large banners, flown line arrays and more extensive lighting rigs. This stage and roof system is normally seen on multi-day events. 2) Non Load Bearing Rooftop – This stage and roof system, sometimes called a shade roof, is used on smaller events. It’s usually made of a mini-beam square and uses crank up towers at each corner to hold the structure up. This rooftop style can not hold much weight – some lighting is generally the most you can put on it. 3) Mobile Stages – Mobile stages are relative newcomers to outdoor events. They can be very useful for festivals and events with tight timelines. However, they are limited on the types of surfaces and grades they can be setup on. At In Depth Events, we own and maintain our rooftops and mobile stages and have provided our rental rooftop systems all over the United States! What Stage and Roof system is best for your event? There are several factors to consider in selecting the perfect stage and roof system for your event. Mobile stages work well for quick in-and-out. Load bearing structures are better for larger events requiring custom signage. Shade roofs are perfect for smaller events. Of course, knowing the production requirements of your event is key to selecting the rooftop as well. The important thing is to find a production vendor who can help you with all aspects of the production needs – everything from stage and rooftop to audio, lighting, video, and event generator and power distribution rental. In Depth Events is that company! Ask Us a Question to find out how In Depth Events can provide rental stage and roof systems for your next event. Our friendly event professionals are happy to help!